Click on quilts for larger view. $250 cash, plus entire RT hand-dyed collection, over $1400 value total prize package. 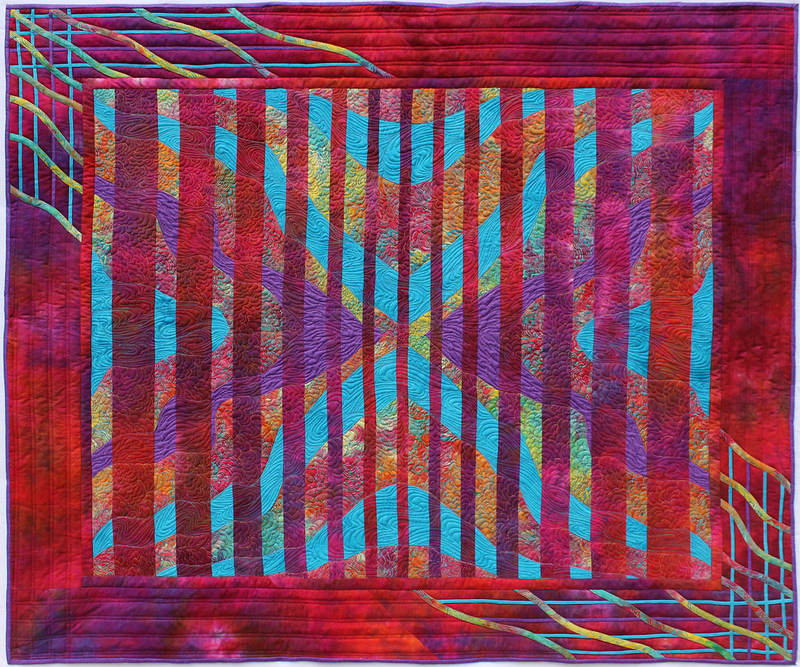 "My Harmonic Convergence is made using the Fire Dragon Challenge fabric. 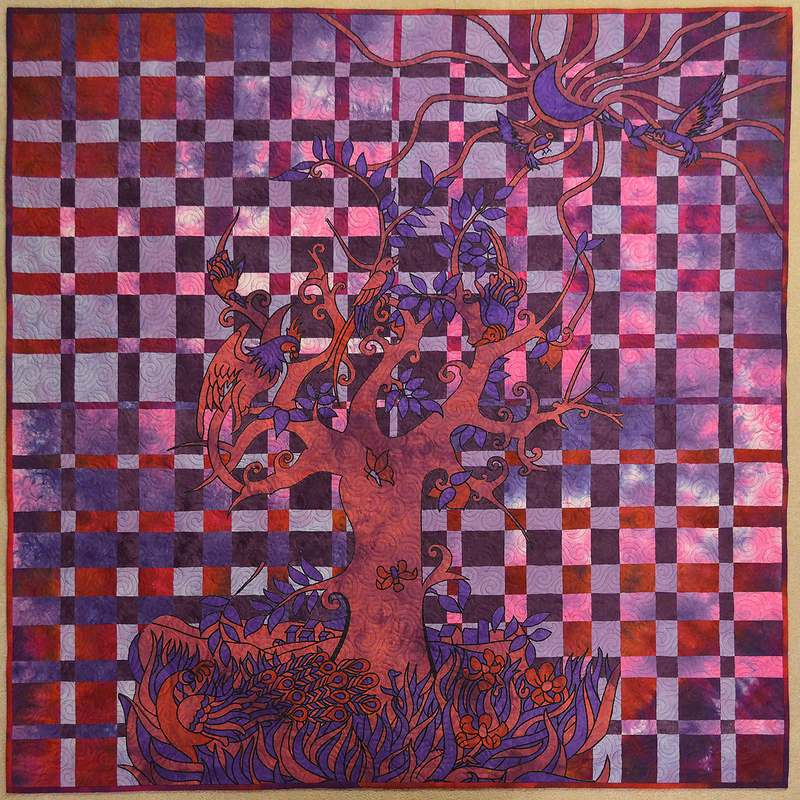 I added 2 other Ricky Tims hand dyed fabrics which complement the Tree of Life batik panel I purchased from Shalawalla Gallery & Gift Shop in La Veta. I fussy cut out the appliques for my Harmonic Convergence from the panel. Four Harmonic Convergence sections were made and joined together. 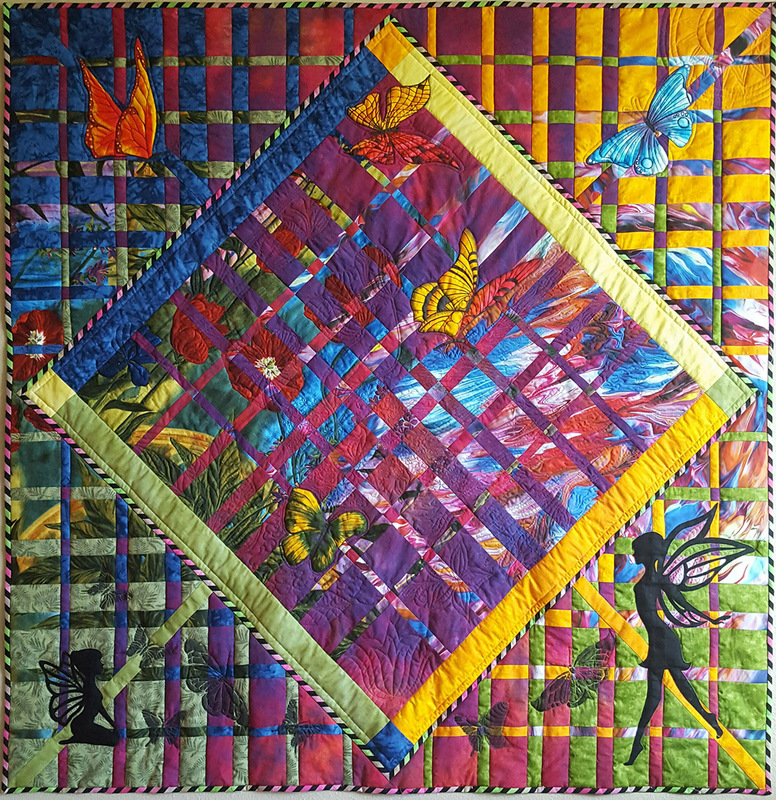 The special message this quilt conveys is all about the cycle of life and the harmony and balance that must be presence in order to have a happy and healthy life. It is quilted with Superior King Tut variegated thread." $50 cash, plus 10 yards hand-dyed fabric, $300 value prize package. "My mystery fabric was red, which is my favorite color. I combined it with Stephanie Brandenburg 'sketch flower fabricated fabric that looked like colors on a palette. These created magical convergence that flowed from the artists palette to a garden of flowers. Magical fairies at the lower outside convergence are letting in the black (color void) butterflies to fly in the inside convergence where they acquire proper coloration. These black colored butterflies are created with a stencil and inked in. Colourful butterflies are appliqués and seem nicely puffed up because of the wool batting." "This is a mind picture I saved from a flight home from Fairbanks more than 10 years ago. 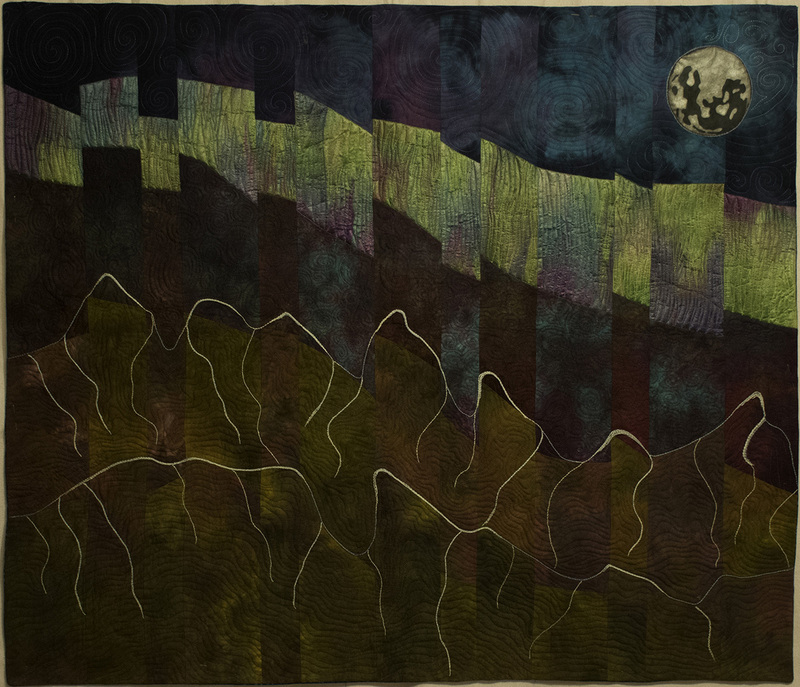 I looked out the window and saw the moon, glaciers and aurora and now it is a quilt! RIcky TIms hand-dyed fabric, handmade Silk Fusion, Shiva painted moon, hand embroidered glaciers." "I combined 3 parts of Ricky's Caveman fabric with one part of a formal print with metallic gold accents. Took forever to decide how to quilt it, but I finally decided to try couching some gold-flecked yarn onto the grid to make it look like a woven window grill. 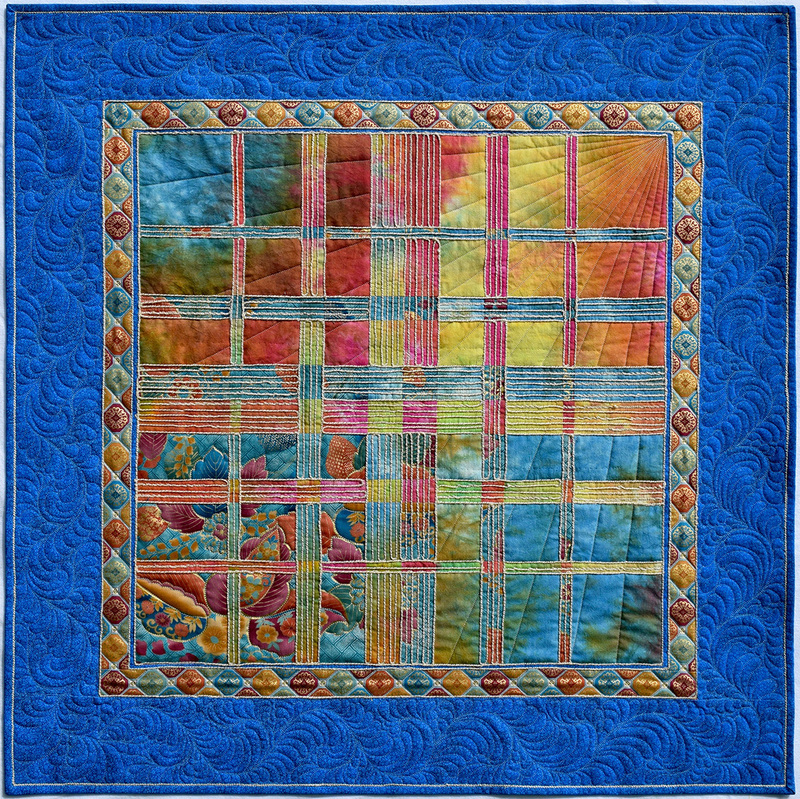 The border is quilted in an amish feather pattern. Both the feathers and the couching were "firsts" for me." Frankford, DE - 56" x 46 1/4"
"Quilt is based on the Fire Dragon mystery fabric I received and uses a batik, a print and another of Ricky's hand dyed fabrics. I pieced 4 identical curved sections and joined them as the basis of the center convergence. The corner border treatment is machine appliqued bias strips. 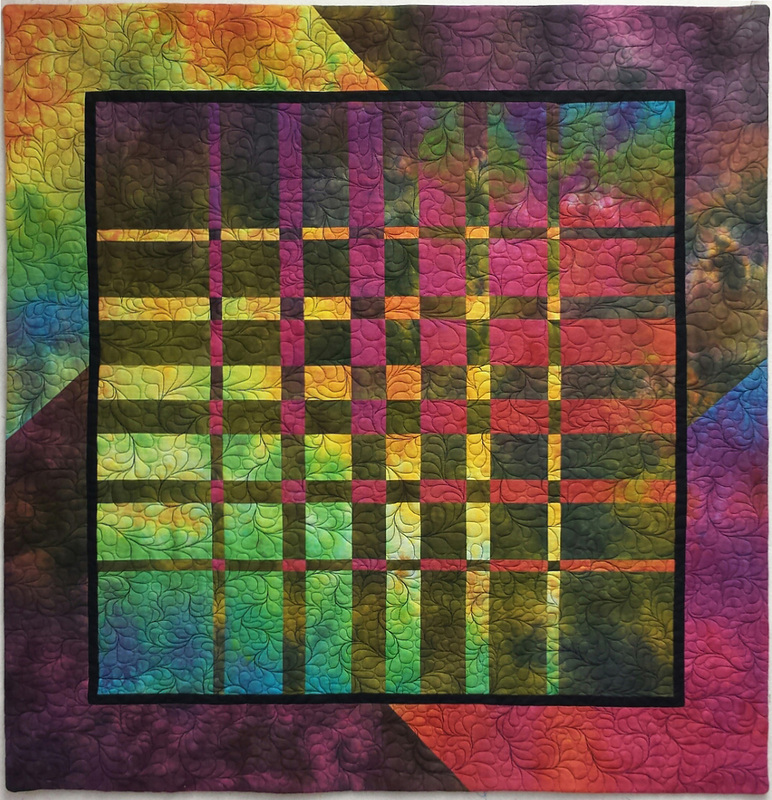 Superior Thread's Rainbow was used for all quilting except stitching in the ditch." Valley Center, KS - 31.5" x 32.5"
"I love the blue/purple/green of the challenge fabric mixed with a print I couldn't walk away from one day of shopping. The print circles escape into borders and across stripes intertwined with black and white ribbon tails." 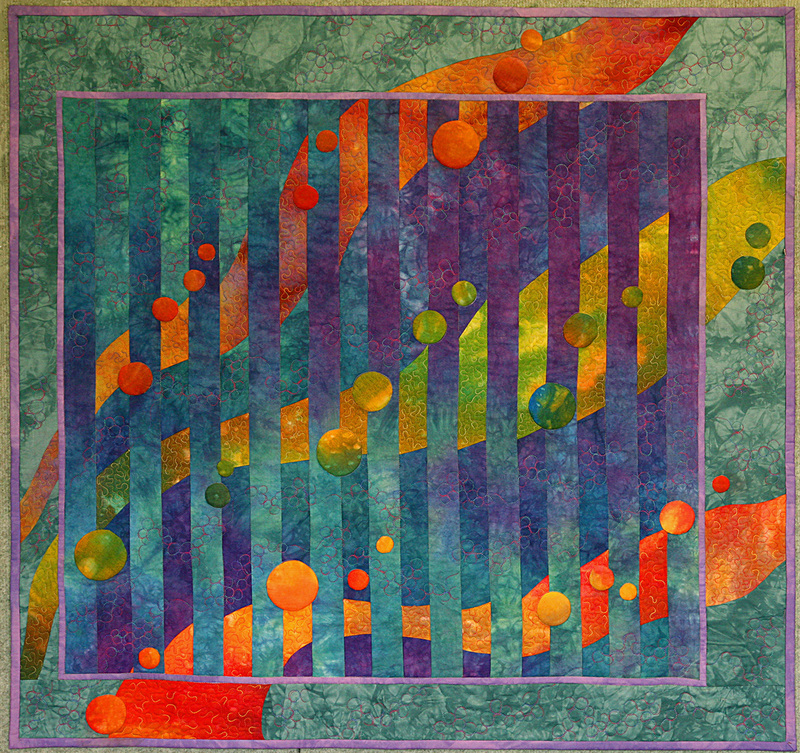 Westmont, IL - 32" x 33"
"Harmonic convergence with set-in corners, heavily quilted with free motion feathers. All fabric is Ricky Tims hand-dyed, except black inner border." 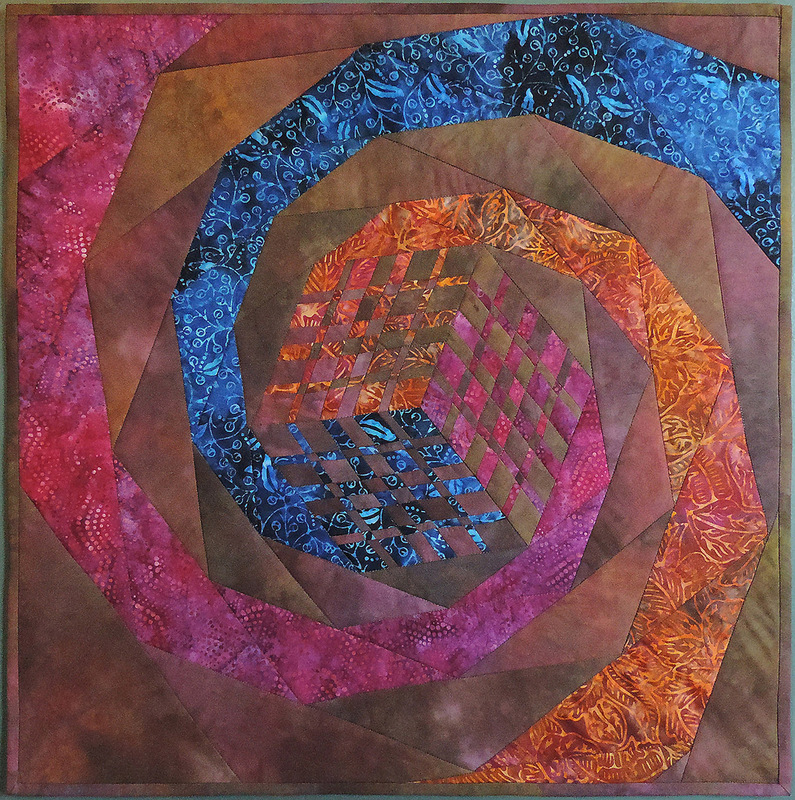 Pambrun, SK, Canada - 26.5" x 26.5"
"Converged Tumbling Block surrounded by 120 degree Snail Trail to edge of quilt to put a new spin on Convergence Quilting. This art quilt was a mystery from start to finish. Thanks Ricky!!!" "I am a novice SCUBA diver and one of my favorite fish are the seahorses – although I’ve yet to see one in the wild. 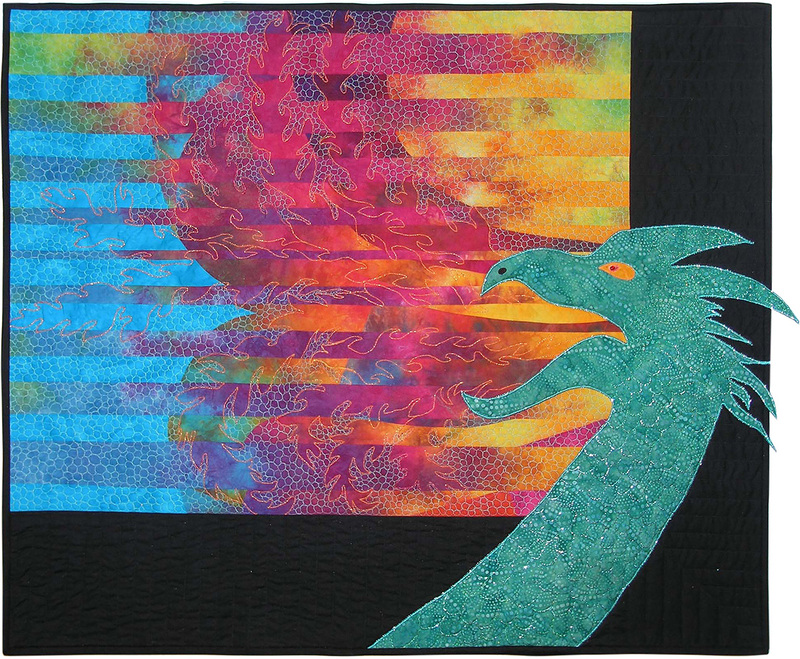 Machine pieced background, seahorse fusible appliqué collage, machine quilted." 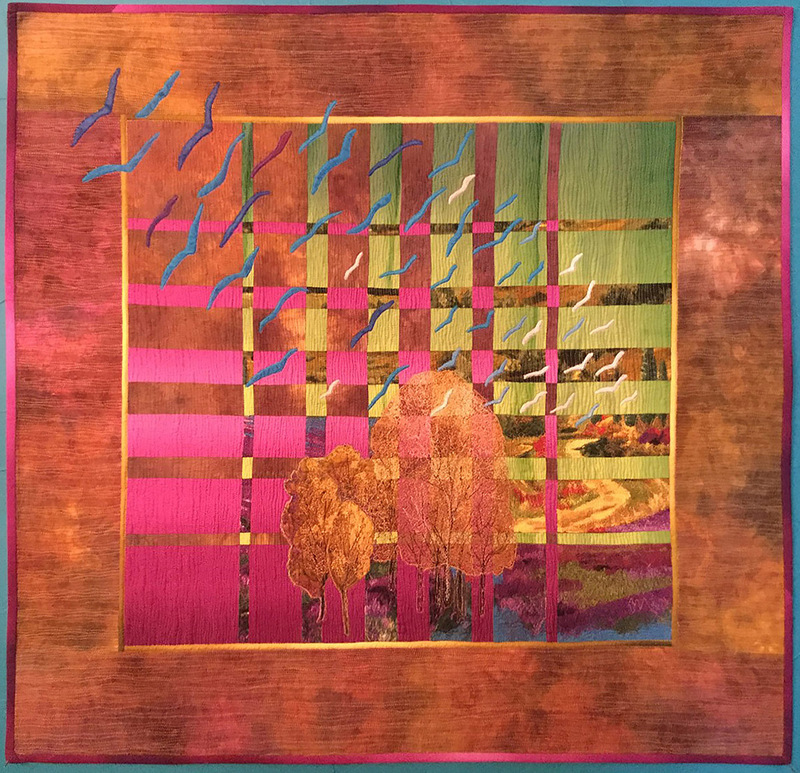 "Harmonic Convergence made with gradation and hand dyed fabrics and a fabric panel, applique birds and trees, thread painted trees and other thread enhancements, densely quilted"
"Grand Convergence with free motion embroidery, fm quilting and bobbin work using Caveman Bright with inserts before cutting strips. Flame quilting echos swirl of inserts. Dragon is original drawing. Would love to be fly on wall when you see photo." "The story of this piece starts in the bottom right corner with the broken pieces that represent me, and the devastation I felt when given a diagnosis of uncurable cancer in May of 2016. My face emerges from the broken pieces and begins the journey on the pathway of circles. Each circle has a word embroidered on it starting with fear, and then darkness, broken, pain, Believe, treasures, peace, joy, hope, and thankful. The silhouette represents me being thankful with open arms to receive the love surrounding me represented by the three curling pieces from the edges." Congratulations to all of the winners - stunning work everyone! I know some of the commenters are requesting that all entries be [censored]ed, but I would prefer to not be included. I am happy with my work but would prefer to keep it private now. I don't need to be critiqued as I know what my weaknesses are. I entered because it was fun not because I am competitive. Hope everyone understands. Beautiful work and very inspiring. Congratulations Winners! A peek at all of the entries would be wonderful. 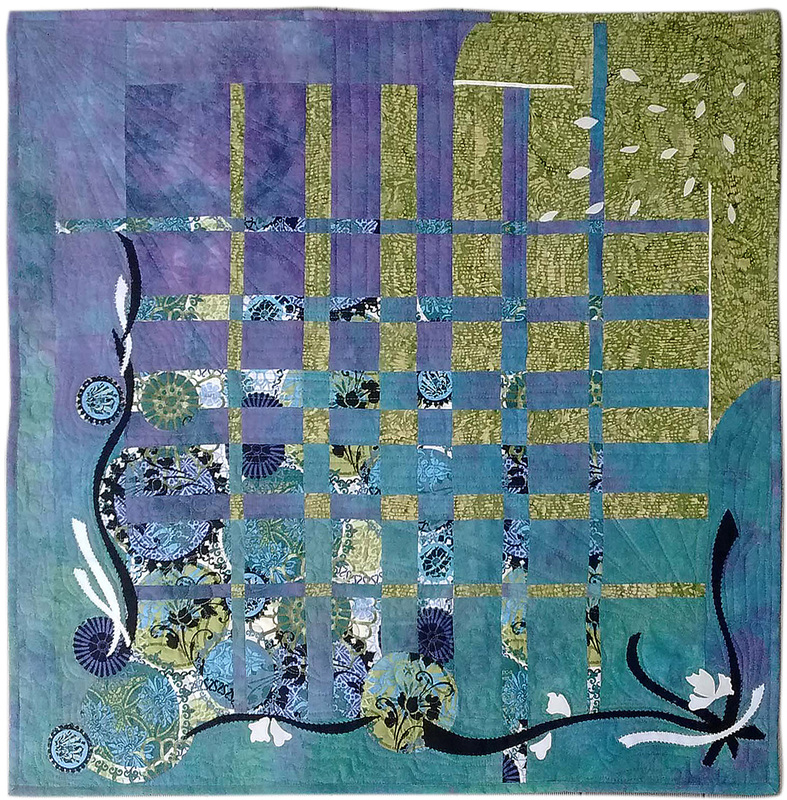 The creativity and colors used in all these quilts is absolutely amazing to me! 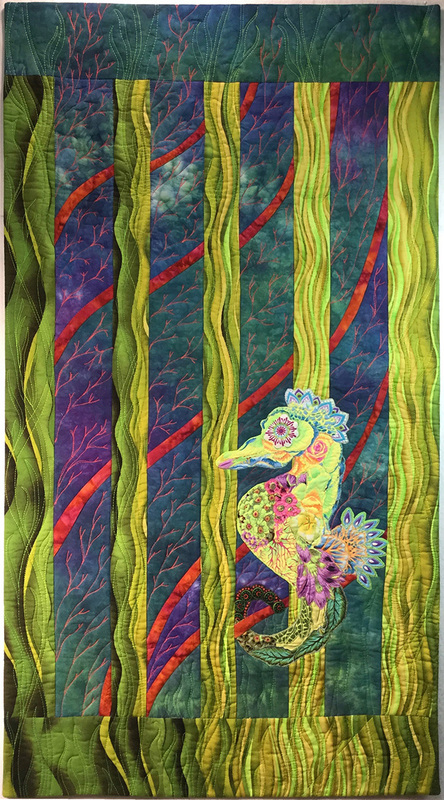 I've sewed for over 40 years but only started quilting a couple of years ago. My creativity is only beginning to surface! Congratulations to all of you! Congratulations to the winners! I too would like to see all the winners. I would particularly like to have some critique on my entry - is that possible? after seeing these, I am glad I missed the deadline due to illness. I would also like to see ALL the entries if possible. Perhaps we who entered could do a Viewers Choice award. Is there a place where we can see all the entries? wish we could see all the entries. I gave the one I did to my granddaughter who was 12 the week after the entries were due. she loved it and is tied to convergence quilts in another one where I used a convergence quilt for the background of a portrait quilt I did of my two granddaughters. 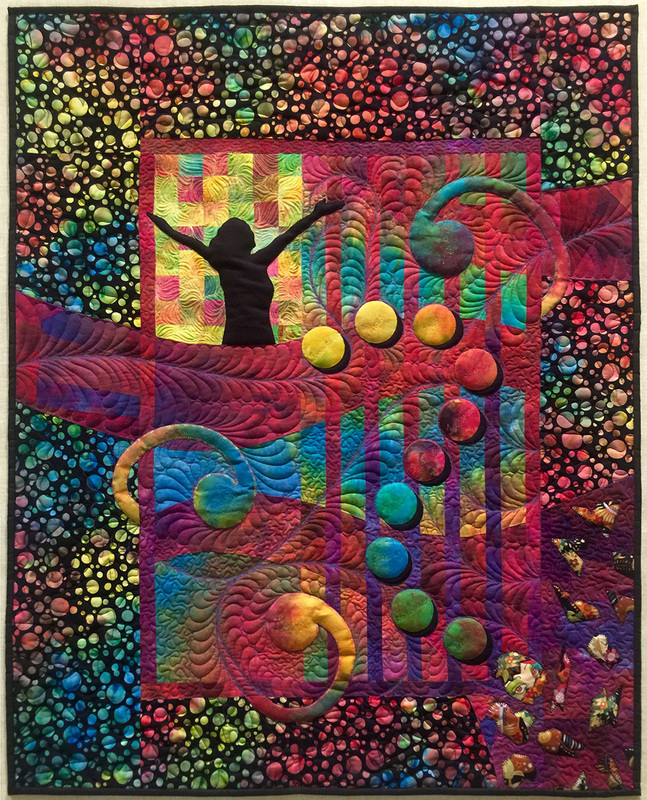 Great quilts, and spectacular winners! Great work, all of you!